In the 1930's, there were few who believed the airplane was good for anything but hauling mail; It wasn't very good at that either. Aircraft of the day were slow and heavy, with limited range. At times it seemed that US Government Air Mail contracts were all that kept them flying. There were those however, that envisioned a day when people would travel by plane, rather than by ship or train. This vision would one day become the commercial airline; but in the beginning there were few willing to build an aircraft for such a purpose. Boeing converted its mail hauling B247 to carry passengers with some success; and then there was Donald Douglas. His Douglas Aircraft Company gave the world the DC-2, and then the slightly larger DC-3. It put the B247 out of business and nearly put an end to William Boeing and his Boeing Aircraft Company. For several decades Boeing would chase the coattails of Douglas, staying in business by providing the US Government with bombers, but Douglas was always one step ahead. His DC-4, 5, 6, 7, and 7C models made offerings from Boeing virtually obsolete as they rolled off the assembly line. The chase would continue for decades. In 1947, the de Havilland Comet brought passenger travel into the jet age - the race was on for American companies to build a jet transport. In May of 1954, Boeing unvailed the 367-80 (Dash 80) prototype. It would soon become the B707 StratoLiner and the KC-135 StratoTanker. Douglas soon countered with the venerable DC-8. Once again Boeing had to scramble to keep up. They had to redesign and customize the 707 to match the DC-8 specs, and to sway buyers like Jaun Trippe of Pan Am away from the DC-8. Ironically, this strategy of specializing airframes to suit customer demands would eventually make Boeing a world leader. In 1965, the Air Force sought out competitors to build a cargo transport plane of tremendous size. Lockheed won the contract and would build the C-5A Galaxy. In the aftermath of the competition, Boeing president William Allen thought the project had merit as an airliner. Boeing engineers from the competition were redirected with the goal of creating a civillian version of the mammoth C-5. Under pressure from Pan Am's Juan Trippe for an aircraft that could carry 10 abreast seating or two rows of standard ship cargo containers, Boeing developed the world's first passenger wide-body jet - the B747. The 747 could carry 400 passengers over long-ranges, a must for profitable intercontinental travel. It could haul cargo too. In 1966 Pan Am became the launch customer with 25 orders (23 passenger and 2 freighter). Five other airlines placed orders for an additional 28 and the die was cast. Development problems and the inadequate engines of the day would drive production costs to the sky. The 747 was a gamble that would pull Boeing to the brink of extinction. As American Airlines' Vice President of Engineering, Frank Kolk had grown tired of Juan Trippe's manipulations of manufacturers and domestic carriers. Trippe had often pressured manufacturers to design aircraft suited to his needs, forcing the competition to buy the same aircraft. Competing airlines often could not afford these new planes, yet Trippe made sure they could not afford to do without them either. In April 1966, Kolk circulated a five page memo and held meetings with both Lockheed and Douglas; he had a new concept. His view was that American Airlines needed an aircraft larger than earlier jets, yet smaller than the 747. It was to carry 220 to 230 passengers in mixed class configuration, with a range of 1,850 nautical miles and the ability to operate at close-in airports such as La Guardia. La Guardia's runway could accomodate a 270,000lb aircraft, and this should be the weight of the new design. Kolk called his concept the Jumbo Twin. Some called it the Airbus. Kolk's proposal would allow several major carriers to operate the same aircraft type over a variety of different domestic routes; but the design seemed too closely suited to American's routes, which were mostly New York to Chicago. Eastern Airlines however, had a key route from New York to Puerto Rico. This route included 1800 miles over water and FAA regulations of the day mandated a minimum of three engines for extended over-water ops, in case one should fail. Additionally, TWA had routes which crossed the Rockies. Once again FAA regulations mandated that a 'Jumbo Twin' be capable of holding alititude with one engine out. This would require nearly 55,000lbs of thrust per engine; no engine of the day could accomplish this feat. As with the 747, the design of the Jumbo Twin was limited by the capabilities of the engines of the time, thus the Jumbo Twin would become a Tri-Jet. Lockheed was eager to get back into the commercial airliner market. They began a major effort at developing Kolk's airliner. The project already had a name: L-1011. Douglas Aircraft also wanted a piece of the action, but was strapped for cash, so in 1967, Douglas sold out to McDonnel Aircraft. 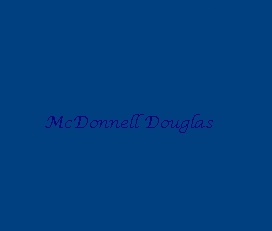 The new McDonnell Douglas would be the fourth-largest American planebuilder, behind Boeing, North American, and Lockheed. The merger would provide cashflow for a new undertaking. With James McDonnell at the helm, they were eager to enter the airliner business. Their new project would be designated DC-10. Douglas decided to mount its tail engine above the fuselage, and though the DC-10 could accomodate the RB-211, GE was developing a new version of their TF-39 (used on the C-5A) called the CF-6, which would be built in Ohio. This gave GE a political trump card to play against Rolls Royce. With such a close competition, the airlines were at a great advantage to dictate terms. In fact, the DC-10's fate would be decided by just one airline - United. American Airlines had placed an early order for 25 DC-10's with options on 25 more. Douglas concluded that this would not be a large enough order to justify the production run and the project was about to be cancelled. Of the five largest carriers, only United remained to place an order as Eastern, TWA, and Delta had chosen the TriStar. The fate of the DC-10 lay in the hands of United's George Keck, and with a very attractive deal from Douglas, Keck chose the DC-10, placing orders and options on 60 aircraft. He also chose to use the GE CF-6 turbofan, as did American's President, George Spater. This decision proved to be more political than technical, as the GE units would be made in the USA, keeping jobs and dollars at home. The CF-6 series would become one of the most reliable turbofans ever built. United's order gave the DC-10 life, and this is exactly why United chose the DC-10 - to ensure Douglas would remain a contender - as more competition would mean lower prices for the airlines. As Keck put it "If we don't buy that airplance, (Douglas) will probably drop the DC-10 altogether. I don't think that's good for Douglas, and I don't think it's good for the country. Douglas might not stay in the commercial business, and I want them in it." The problem with both projects was simply the fact that their were two projects. Both Douglas and Lockheed, aiming to meet the requirements of the 'Jumbo Twin' concept were building virtually the same aircraft. In fact, the performance specs of the two were so close, that the decision to buy one model over the other was based as much on who supplied the engines as on the flip of a coin. This fierce competition divided the market, and gave the airlines bargaining power; prices dropped sharply. Both aircraft were practically being sold at cost, with the hopes that large sales would someday offset the early losses. Unfortuneately, this never really happened. Rolls Royce had been so badly mismanaged that no one in the British Parliament could estimate how much the company owed when it went bankrupt. The British Government would eventually bail out Rolls Royce, if only to save face with Lockheed, and to prevent Britian's labeling as a bad business partner. Never the less, the damage was done. The L-1011 would be delivered late, and only 250 were ever produced. The DC-10 would meet a similiar fate after the plane went into service, suffering a near fatal in flight structural failure, then a fatal crash, due to poor cargo door design and weak FAA interdiction. While the production run would eventually sell 446 units, with 60 being of the KC-10 designation, the DC-10 would never fully escape its past. Orders all but vanished in the early 80's, and the line ended after the last aircraft was delivered to the US Air Force in '89. It would be the last wholly new commercial endeavor Douglas would undertake. Its MD-11 would be a scaled-up improvement on the DC-10, but never lived up to its advertised performance, and the production run was roughly half that of the DC-10. In the end, the DC-10 would win out over the L-1011, but the competition severely weekend both companies. Neither would be a serious contender in the commercial market again. The TriStar would be Lockheed's last commercial airliner. Douglas would one day be bought out by Boeing, who promptly killed the MD-11 series in favor of its own 777. Boeing would then take the soon to be popular MD-95 as its own 717. Over the years, the DC-10 has compiled an impressive safety and reliability record. It would fare much better as a second-hand aircraft, as Charter Airlines such as Hawaiian Airlines, Omni Air International, and Japan Air Charter found them highly attractive for their high capacity, range, and reliability record. Cargo operators were fond of them too. Challenge Air, Gemini Air Cargo, and Federal Express are just a few of the DC-10F operators in business today. In the early 1990's, FedEx would begin buying every DC-10 it could find. Their DC-10 fleet would top 100 as they began upgrading them to the two-man flight-deck of the MD-11, designating it the MD-10 Freighter. The continued reliability and profitability of the DC-10 will ensure that it continues to fly well into the next century - and that I'll still have a job!